Presented by Peter Illei, M.D. and prepared by Alex Chang, M.D. Histology: The tumor is composed of large spindle shaped and polygonal cells that have dense pink cytoplasm and atypical nuclei. Large bizarre tumor cells are seen throughout the tumor (diffuse anaplasia). The mitotic activity is high and focal necrosis was also noted. The tumor infiltrates the paratesticular soft tissue, breaks through the tunica vaginalis and exhibits vascular invasion. The testis is free of tumor. Immunostains for desmin and myogenin are positive. Discussion: Embryonal rhabdomyosarcoma (RMS) is the most common rhabdomyosarcoma and the most common soft tissue sarcoma under the age of 15. The majority (83%) of cases are in patients under 10 years of age with 46% occurring in patients who are less than 5 years old. Embryonal RMS is more common in Caucasians (70%). The majority of tumors (47%) are in the head neck area (orbit, eyelid, oropharynx etc) followed by the genitourinary tract (bladder, prostate, paratesticular soft tissue). Variants of embryonal RMS include spindle cell RMS that usually affects the scrotum and head neck area and can also be seen in adults. Botryoid RMS arise beneath mucosal linings and are composed of polypoid tumor nodules that are covered by mucosa, typically affect the urinary bladder, biliary tract, pharynx, conjunctive, and auditory canal. Pleomorphic RMS is a rare variant and is only seen in adults. 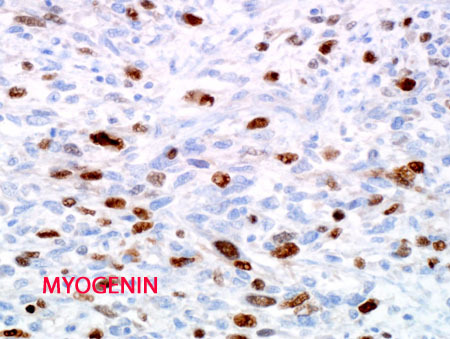 Immunohistochemistry is positive for desmin, myoD1 and myogenin, and may demonstrate aberrant expression of a number of markers in 10-30% of cases (cytokeratin, S100, neurofilament, CD20, immunoglobulin, SMA, and NSE). Typical genetic alteration of embryonal RMS is loss of 11p15 and is present in most cases. The prognosis is better in younger age, in orbital and paratesticular tumors and in children with spindle cell/botryoid tumors. The prognosis is worse if diffuse anaplasia. Please enter your email address to continue to the Johns Hopkins Surgical Pathology Case Conference website.